Eggs are an important part of the diet and for those who do not have any allergies to them, they are an essential source of nutrients. And what better way to enjoy them than in pancakes! Eggs are a complete form of protein, a great source of selenium (a powerful antioxidant) and iodine and can also be considered a good source of B vitamins. Eggs also contain a small amount of Vitamin D, helping to boost the immune system. Eggs also contain choline, which has been linked to brain health and function, as well as the methylation cycles in the body, which has been closely linked to heart health. The link between eggs and raised cholesterol levels is continually being questioned and the standard advice these days is that it is ok to eat 6 eggs a week as part of a balanced diet. There are findings that suggest it is the saturated fat levels in your diet, rather than the amount of cholesterol in your diet which has the greatest impact on your blood cholesterol levels. Eggs are also extremely versatile in cooking, being used in baking, goodness in pancakes and crepes and a boiled or poached egg is a great start of the day. This recipe makes about 8 medium pancakes to increase the proportions to suit your family size. Heat a large frying pan over a medium heat. Pre heat the oven to 140 oc and place a plate in there. Hand whisk the egg in a mixing bowl and add the milk. Sift in the flours and add the cinnamon and salt and mix well. 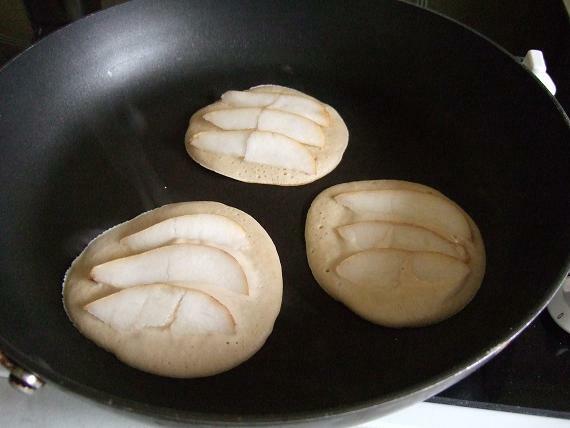 Add a teaspoon of oil to the pan and use kitchen paper to spread evenly. Use the first the pancake as an experiment. Add two tablespoons of the mixture to the pan and swirl into a circle with the back of the spoon. 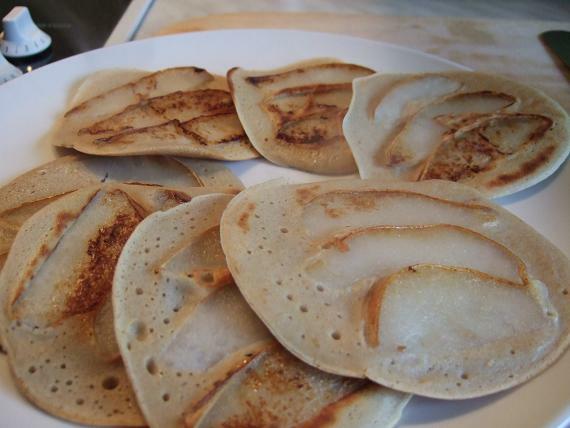 Place three thin slices of pear on top. Cook until the mixture has bubbles coming up through it and flip over and cook them on the other side. Be careful not to burn the pears. Once you are happy with the mixture continue cooking. If I feel the mixture is to watery (like a crepe) I'll add a little more flour. If I feel the mixture is to sticky, I'll add more milk. Depending on the size of your pan, you can cook up to three or four at a time. When the pancakes are cooked, place them on the plate in the oven till ready to serve. I have mine with maple syrup and yogurt.